“I quite enjoyed it. The first time at least,” said Mrs Diner wearily, waving a fork in the general direction of the piped music. Jamie Lawson’s ‘Wasn’t Expecting That’ was doing its second lap of the dining room’s CD player. The music wasn’t the only thing that gave me a sense of déjà vu. 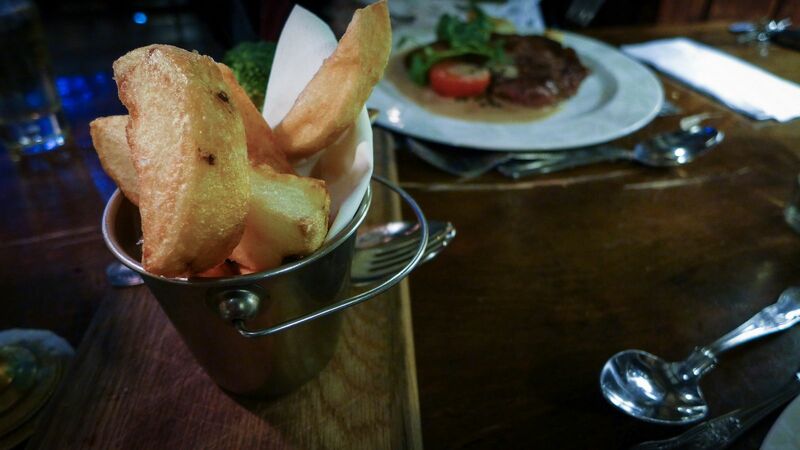 Our whole meal was turning into the kind of underwhelming, old-fashioned dining experience I’ve encountered all over Central Northumberland. 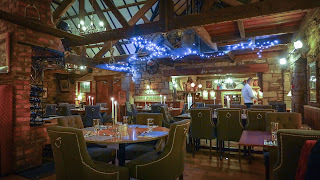 The standard of restaurants in this part of the county, with a few notable exceptions, is now light years behind Newcastle, and I simply can’t work out why. 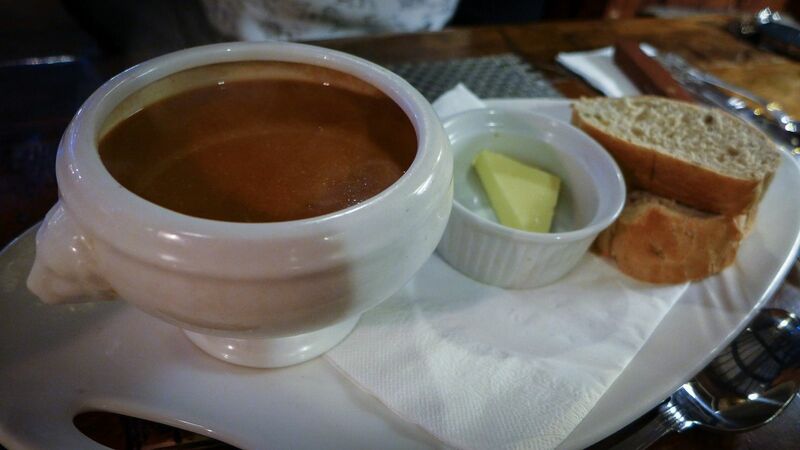 Most of my Northumbrian friends are much more sophisticated and modern than the restaurants that serve them. Of course I accept that not every kitchen can dazzle; most just have the relatively simple task of feeding lots of people well, without fanfare. I’m guessing this is the role of the Cook and Barker which, as their website has it, is “a real traditional Northumbrian Country Inn”. Set back from the A1 just south of Alnwick, the restaurant’s menu is a list of safe and familiar dishes, the type of things lots of locals must really look forward to on a Saturday night out, for the large dining room was packed. It actually took us an awful long time, and several Jamie Lawson tracks, to figure out what on earth we were going to eat. Across the table d’hôte (£29) and à la carte menus we had to wade through ten starters and twenty-six (yes, really) main courses. 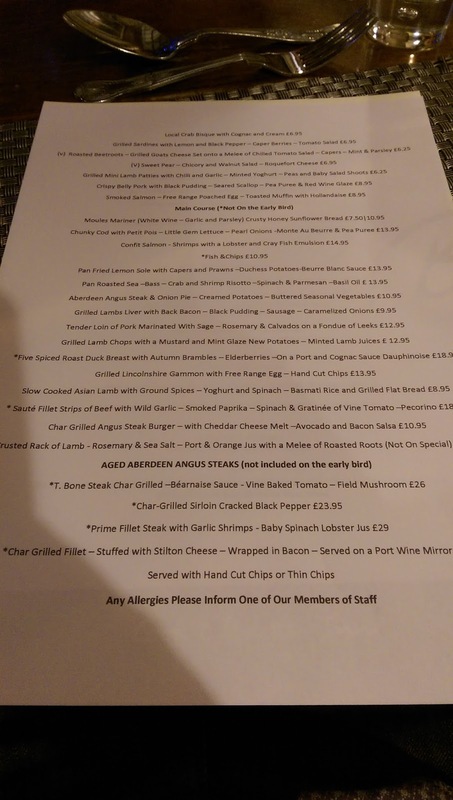 There was seafood, lots of steak, lamb, grills and even, bless it, baked gammon and fried egg (I wondered if they served it with a ring of pineapple). This place doesn’t appear to welcome vegetarians – their one token main course offering was penne with pine nuts. 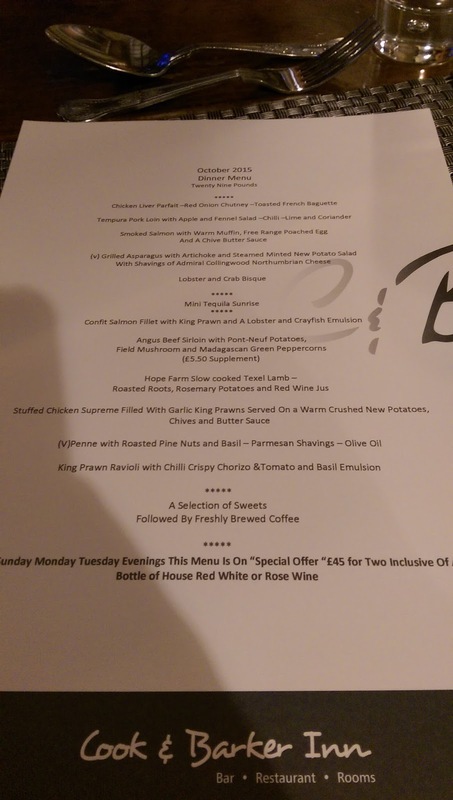 Despite the absurd length of this menu, none of it suggested any originality or ambition; how any kitchen could be expected to cook food of quality from a list this long is just the kind of problem that Sweary McGordon gets so exercised about on his TV shows. As a result, nothing of real note made its way to our table. Take my five-spiced roast duck main course (I rather wish I hadn’t): the breast had been overcooked to an uncompromising shade of ashen grey, and yet the skin remained uncrisp. Alongside this slumbered an exhausted block of dauphinoise, the discolouring of the potatoes hinting at the length of time they’d been hanging around waiting for someone to order them. A shame all round, as the duck retained decent flavour, if not texture, despite its manhandling. I struggled to detect any of the advertised hedgerow and elderberry notes in the jus. Mrs Diner’s sirloin suffered exactly the opposite fate, being cooked so rare that some of the sinewy tissue hadn’t broken down. 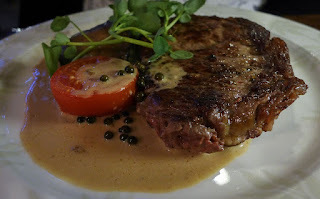 The Cook and Barker source their beef from their own Hope House Farm, so we were expecting a first-rate steak, but this lacked depth of flavour, perhaps due to scantness of seasoning. Our starters had been a little better, but were still nigglesome. A lobster and crab bisque was rich and packed some proper umami depth, but while the crunch of cracked shell at least proved it was home-made, I’d rather the bits had been sieved rather than forcing me to filter them out with my teeth. 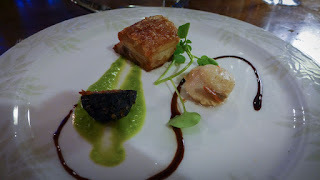 A tender and flavoursome piece of belly pork came with a sweet scallop, a swoosh of pea purée and some decent black pudding. This would have been rather good had the skin of the pig been crisp as advertised. Instead, it stuck gummily to the teeth. Not a dish for dentures. 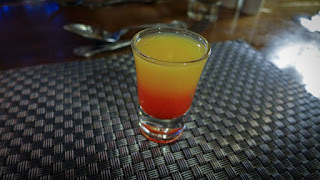 Mrs Diner, who ordered from the table d’hôte, was given a weird glass of tequila sunrise as a palate cleanser between courses (it had the opposite effect on her palate), whereas I, eating from the more expensive à la carte, was offered none. A stingy omission. Otherwise, service was cheery and brisk, as it had to be with so many customers. The dining room in which these dishes were served is an attractive part of an old building featuring exposed stonework, bare wood floors and some serious timber beams. Apparently it used to be a blacksmith’s, which explained the well in the middle of the room. I don’t often comment on chairs, but these, let me tell you, were very comfy indeed. The Ancient Diner would have approved. Here and there were hung the tools of the hunt, which made me wonder why, bang in the middle of the season, there was no game on the menu? 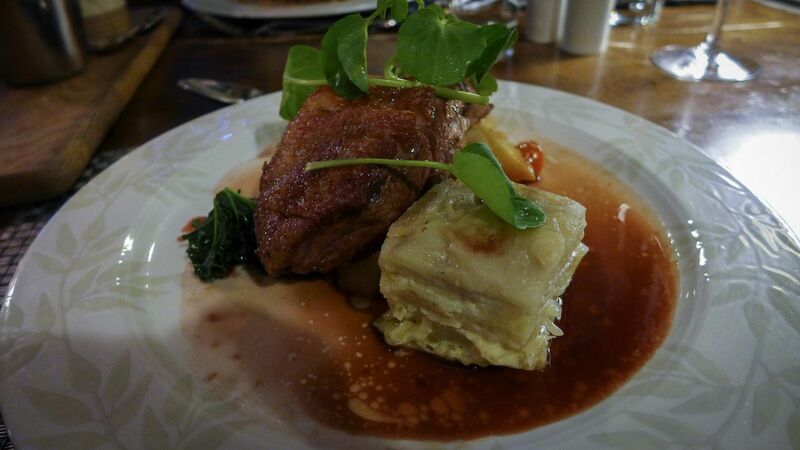 No fewer than eight main courses featured beef: where was the pigeon salad, the roast grouse, the game pie? It’s almost impossible to drive here without running over a pheasant or two – and they surely could have cadged a few haunches of venison off the Duke of Northumberland’s estates just up the road. 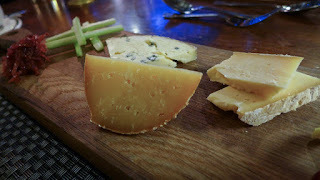 I consoled myself with a plate of excellent cheese, including Doddington’s admirable first attempt at a blue, Darling, and a tangy three-year-old Gouda. The former perfectly matched a glass of treacly Pedro Ximinez sherry, but as ever there was a catch: the cheeses were almost fridge-cold. Mrs Diner finished with meringue and cream. 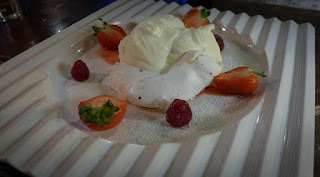 I adore chewy meringue; this one wasn’t. Despite my whining, this wasn’t a truly awful meal; it was just frustrating. It’s clearly very popular, so maybe I’ve just got it wrong, and this is exactly what people want. They are clearly being served exactly what they expect, and this place has been around forever so maybe I should just let them get on with it. Through the mediocrity, though, there were flashes of what might have been. A shorter, far more focussed menu, including something that someone has shot, proper care of decent ingredients, and attention to detail – is that too much to ask? Particularly as our bill came to just under £72, including just a couple of glasses of reasonably priced wine. That’s not completely outrageous, but more than enough for us to expect something better. As Jamie Lawson would say: I wasn’t expecting that.